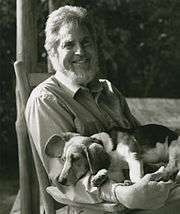 Guy Hughes Carawan, Jr. (July 27, 1927 – May 2, 2015) was an American folk musician and musicologist. He served as music director and song leader for the Highlander Research and Education Center in New Market, Tennessee. Carawan sang and played banjo, guitar, and hammered dulcimer. He frequently performed and recorded with his wife, singer Candie Carawan Occasionally he was accompanied by their son Evan Carawan, who plays mandolin and hammered dulcimer. Carawan and his wife lived in New Market, near the Highlander Center. Carawan first visited the Highlander Folk School in 1953, with singers Ramblin' Jack Elliot and Frank Hamilton. At the recommendation of Pete Seeger, he returned in 1959 as a volunteer, taking charge of the music program pioneered by Zilphia Horton, who had died in an accident in 1956. When college students in Greensboro, NC, began the lunch-counter sit-in movement on Feb 1, 1960, Highlander's youth program took on a new urgency. Highlander's seventh annual college workshop took place on the first weekend in April, with 83 students from twenty colleges attending. As part of a talent show and dance, Carawan taught the students the song "We Shall Overcome." Two weeks later, on April 15, two hundred students assembled in Raleigh, NC, for a three-day conference at Shaw University. Called by the Southern Christian Leadership Conference (SCLC) to develop a youth wing, the students instead organized the independent Student Nonviolent Coordinating Committee (SNCC). They invited Carawan to lead the singing, and he closed the first evening with "We Shall Overcome." The audience stood, linked hands and sang—and went away inspired, carrying the song to meetings and demonstrations across the South. I don’t think we had ever thought of spirituals as movement material. When the movement came up, we couldn’t apply them. The concept has to be there. It wasn’t just to have the music but to take the music out of our past and apply it to the new situation, to change it so it really fit.... The first time I remember any change in our songs was when Guy came down from Highlander. Here he was with this guitar and tall thin frame, leaning forward and patting that foot. I remember James Bevel and I looked across at each other and smiled. Guy had taken this song, "Follow the Drinking Gourd" – I didn't know the song, but he gave some background on it and boom – that began to make sense. And, little by little, spiritual after spiritual began to appear with new words and changes: “"Keep Your Eyes on the Prize", "Hold On" or "I’m Going to Sit at the Welcome Table". Once we had seen it done, we could begin to do it. Guy and Candie Carawan, compilers, We Shall Overcome! (New York: Oak Publications, 1963). Guy and Candie Carawan, compilers, Freedom is a Constant Struggle (New York: Oak Publications, 1968). China: Music from the Peoples’ Republic. Rounder Records, #4008, CD, 1976. Recorded in China by Guy and Candie Carawan. They'll Never Keep Us Down: Women’s coal mining songs. Rounder Records, #4012, 1983. Includes Hazel Dickens, Sarah Gunning, Florence Reece, Phyllis Boyens, Reel World String Band. Dedicated to Sarah Gunning who died November 14, 1983. Produced by Guy & Candie Carawan for Rounder. Songs with Guy Carawan, vol. 1, Folkways Records, FG 3544, 1950. This Little Light of Mine, Folkways Records, FG 3552, 1960. 1 2 3 4 Neely, Jack (2005). Lifelong Students, Eternal Activists. Metro Pulse (Internet Archive). ↑ Adams, Frank (1975). Unearthing Seeds of Fire: The Idea of Highlander. pp. 152–155. ↑ Interview, 1983, quoted in Sing For Freedom: The Story of the Civil Rights Movement Through Its Songs, 1990, p. 4. ↑ "May Justus, The Carawan Recordings". Knoxville, Tennessee: Jubilee Community Arts. Retrieved July 15, 2012.